The most critical time in a newborn potbellied pig’s life is from birth until the time he is weaned. This is when he is most susceptible to illness and premature death. Sixty-five percent of piglet mortality occurs within four days of birth. Newborn potbellied pigs will grow to be 100 to 250 pounds in adutlhood. Rapid growth occurs during the first year of life, but potbellied pigs are not fully mature until 3 or 4 years of age. These first few weeks are critical in laying the groundwork for a healthy life. Newborn potbellied pigs possess little fat reserve and almost no hair. They are extremely susceptible to cold weather and drafts, which can cause diarrhea and pneumonia. Newborn pigs need an environment of 95 degrees Fahrenheit. You'll decrease this temperature by 5 degrees weekly until the pig is weaned. You'll use a heating device such as a gas or electric heater, a heat lamp or a heated floor mat. Each of these is a potential fire hazard, so keep cords out of reach and heating devices secured well. If a piglet becomes chilled, you can warm him by wrapping him in a blanket and holding him close to your body. Then place him under a heat lamp until he feels warm and comfortable. It is critical that newborn potbellied piglets receive adequate colostrum and milk from their mother. They should nurse 15 times within their first 24 hours. Failure to nurse adequately can result in death. Potbellied pigs should nurse until they are 6 to 8 weeks old. Weaning a piglet too early can jeopardize his health. A piglet should receive his nutrition solely from his mother for his first 2 to 3 weeks. After this time, you can start supplementing your piglet’s diet with a starter feed from a local farm store. If you are caring for an orphaned piglet or one who has been separated from his mother, you can pan-feed him by 12 hours of age. If pig milk is not available, goat milk is the best substitute. A newborn potbellied pig should consume a half-ounce of milk at each feeding; a week-old piglet should eat 1 ounce per feeding. Feed every four hours. Provide adequate bedding to keep your potbellied piglets comfortable. Hay, straw, wood shavings and shredded paper are all possibilities. Avoid using bedding if you install heated mats on the floor. Keep your piglet's home clean. 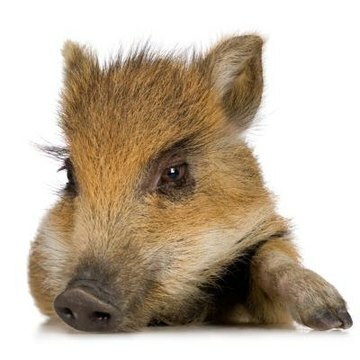 Scrub the pig pen with soap and water to remove dirt and bacteria. Next, spray a 2 percent chlorine solution to sanitize the area. Scrub the sow with soap and water as well to prevent her from spreading bacteria to her piglets. After birth, dose the navel in iodine to prevent the area from becoming infected. Since newborn potbellied pigs are deficient in iron and do not receive this mineral from their mother’s milk, they need an iron supplement. If you do not have experience vaccinating animals, ask your veterinarian to give an iron injection. Another school of thought is to provide your piglets with a box of dirt for them to play in. This will help them receive adequate iron naturally instead of through an injection. Iron injections have been known to cause diarrhea.